Where to begin? We do know one thing; the Cardinals always seem to do things in edge-of-your-seat fashion. The unexpected seems to somehow always be expected. An offense that had an occasional long ball in the regular season became their recipe for victory in the beginning of this postseason. Pitching was as expected, with the exception of a rare Adam Wainwright hiccup in Game 1. But was it that rare? My friend Brian Hoffman, a statistical wizard, dug this tidbit up: In the playoffs since 2012, Waino’s ERA at home is 1.77. On the road, 8.20. Should there have been a Game 5, Wainwright would’ve taken the mound. Now he gets to rest. Let’s just hope that the Giants can wrap up those Nationals so that the Cardinals get that home field advantage where Wainwright can start Game 1 at home versus the road in Washington. Enter Clayton Kershaw. The favorite to win the National League Cy Young and possibly the MVP as well. He did nothing but dominate…until the seventh inning of both of his starts. He pitched well in Game 1, and possibly even better in Game 4. Yet that unlucky seventh inning got him both times. 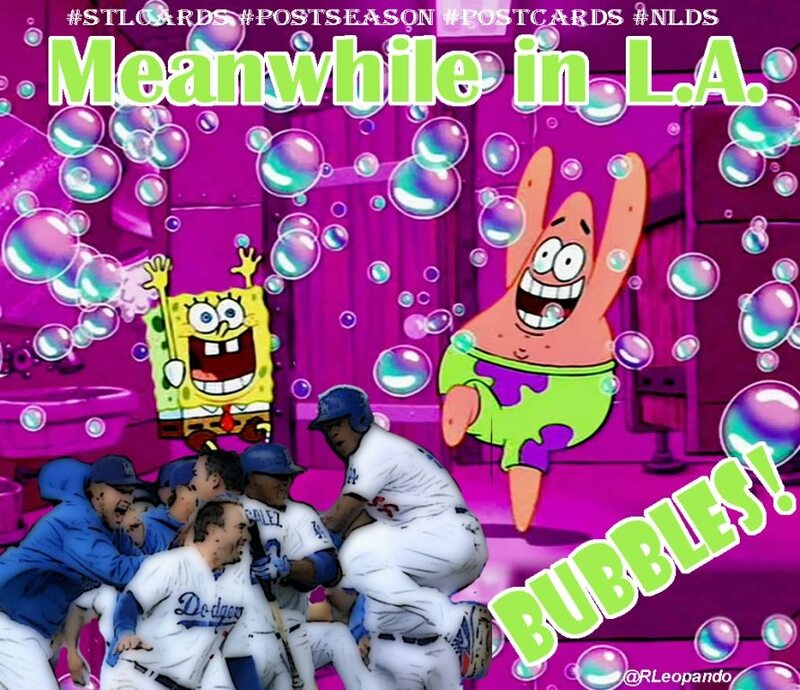 It seems that the postseason is Kershaw’s kryptonite. A regular season of 21-3 with a 1.77 ERA and a postseason record of 1-5 with a 5.12 ERA, which in his last three games is 0-3 and a 9.72 ERA. Hmmmm. Maybe players decided to only steal signs off of him in the postseason (insert sarcasm here). Then came “Strike Zone-Gate.” The most vocal about it was Matt Kemp, and Dodgers manager Don Mattingly chimed in as well. Let’s all get one thing straight. Yes, the Dodgers got some bad calls. But so did the Cardinals. The umpires were at least consistent in calling bad pitches to both teams. Sorry L.A. but you can’t use that as your excuse. It’s part of the game. I chatted with a long time friend of mine since grade school, Ben Margalski*. He was that kid on your baseball team that you were glad was on your team. He went on to get drafted out of high school as a catcher and can attest to this. The Cardinals just kept on going though. Lance Lynn and the team battled but came up short in Game 2. But in Game 3, John Lackey did what the Cardinals wanted him to do. The veteran showed he was still capable of the big stage, which is the reason the Cardinals went out and got him. He’s a gamer, a competitor, and he proved it. Combine that with another late game rally fueled by Kolten Wong, and that turned into a 2-1 series advantage. On to Game 4. Shelby Miller FINALLY got his chance at a postseason start. But it was against a Clayton Kershaw pitching on three days’ rest. As I mentioned before, I think he may have pitched better than in Game 1…until the seventh inning that is. He finished the game with 9K’s until Matt Adams’ 3 run blast sent him to the dugout to sit next to a benched Yasiel Puig. After being left out last year, Miller pitched a solid game and once again the Redbirds were backed with a late game rally. Four years. Four postseasons. Four NLCS appearances. No wonder why people hate the Cardinals. They go about things quietly without drama. They don’t spend money like the Yankees ($209,416,323 2014 team salary), Red Sox ($154,512,396 2014 team salary), or both LA teams (Dodgers $238,841,005 2014 team salary, Angels $127,062,000 2014 team salary). Yet they get here. Every. Year. Mike Matheny always mentions going a “Hard 9.” I think we can chalk up this NLDS to that. *Ben Margalski attended Northwest High School in House Springs, MO, where he graduated in 1997. Cardinals win their 75th game of the season!